Protect Whiterun from the Stormcloak invasion. Destroy the attacking force of Stormcloaks. (Optional) Talk to Jarl Balgruuf the Greater after his speech. At the end of Message to Whiterun, report to Legate Quentin Cipius and he will tell you the latest news about the Stormcloaks and give you your new orders: "The Stormcloaks are here. In force. Get down to the front line. This is it. We must hold the city. Move it!" Upon leaving Dragonsreach, you will find Whiterun under siege by Stormcloak catapults. Along the city wall of the Plains District, the Imperial Legion will be returning fire with their own catapults. The streets will be busy with citizens running back to their houses and city guards making ready to fight the enemy. Whiterun will suffer great destruction during the battle. Severio Pelagia will be killed and his home, as well as Heimskr's, will be destroyed. Soon after Rikke finishes her speech, the Stormcloaks will start their attack. Their archers will provide suppression fire from a distance outside the gate, while the main force will move up the main road in groups. First, you need to defend the barricades, then the drawbridge. Finally, you need to kill attacking soldiers until the percentage of attackers remaining drops to zero. Legate Rikke and Hadvar, both of whom are essential and cannot be killed, will give you a hand during the defense, so stay close to one or both of them if you are having difficulty. The united force of Whiterun guards and Imperial soldiers will take advantage of the fortifications and draw the attention of many enemies. Don't worry if you are unable to defend the barricades or drawbridge. It does not affect the ending of the quest or your reward. When the percentage of remaining attackers drops to zero, the battle will be over. Any surviving Stormcloaks will lose heart and flee the battlefield. "Revel in your victory here today, even as the gods revel in your honor! They already sing of your valor and skill! The halls of Sovngarde are no doubt ringing with your praises! In defeating these Stormcloak traitors, you have proven the hollowness of their cause and the fullness of your hearts. The citizens of Whiterun are forever in your debt! But Ulfric will not stop here. No, he will continue to strike out against any true Nord who remains faithful to the Empire. He will continue to sow discord and chaos wherever he can. And so, we must each one of us, continue to fight this insurrection, lest our fallen brothers have died for naught! Lest our honor be lessened should we allow these bloodthirsty beasts to prowl our lands! Carry on men, my gratitude and blessings go with you! For Whiterun! For the Empire!" At the end of his speech, you may talk to him. The jarl will thank you and grant you the privilege of buying a house in his city, if you haven't already: "Thank you for your role in all of this. It'd be my honor should you decide to make Whiterun your home. Speak with Proventus. He'll make the necessary arrangements." This quest, Battle for Whiterun (Stormcloaks), Battle for Solitude, and Battle for Windhelm are all different radiant versions of the same quest. Your horse can easily be killed if it's waiting by the stables, as it does if you fast-traveled here. Followers who are accompanying you when receiving this quest cannot exit the Whiterun city gates with you, and instead stay inside the walls until you return. Select the "part ways" dialogue before leaving the city gates and recruit them again on the other side. This does not work for followers who return to Whiterun when dismissed, such as Lydia or Jenassa. During the previous quest Message to Whiterun, tell your follower to wait just outside the city gates before returning Ulfric's war axe to the jarl. It can be somewhat difficult to keep the barricade intact because your own archers will shoot at it while trying to shoot the enemies. To get around this, you can run past the stable and into the field. This is essentially the spawn point. You will have to kill about 50 enemies by yourself, but they will prioritize attacking you over the town. In fact, defending the city becomes much easier when exactly one of the barricades is down, as the gap will form a bottleneck and the Stormcloaks will ignore the other barricade. There is a temporary Stormcloak camp outside the city next to the Meadery. If you run to it directly after the battle, there will be one Stormcloak Soldier in the large tent looking at the map, but no other inhabitants. After this quest Fort Greymoor will be garrisoned by Imperial Soldiers. Legate Quentin Cipius may not start this quest, instead giving only generic greetings. Random dragon attacks may occur in and around the city of Whiterun during this quest. When defending the barricades, if you destroy both of them yourself before the enemy does, the Stormcloaks will be unable to find the barricades and you will end up fighting on the field alone. ? There is a rare situation where you and the enemies will not be able to destroy the barricades. ? Restarting the game will fix this. After you finish this quest, [...] may appear in your journal instead of the name of the next quest and the quest marker will disappear. Do not stand next to Balgruuf when he's running up the ramp to deliver his speech. Go stand in among the soldiers he will be addressing below him. Then you will be within the trigger area and the quest will correctly update. NPCs such as Aela, Lydia, Lucia (if adopted), and your hired bard may appear as soon as you leave Whiterun and be attacked by the Whiterun guards. Additionally, no Stormcloak guards will spawn. Be sure to dismiss all followers before exiting the city gates, Additionally, move your family to a different city before you start this quest. Use the console command setstage CWSiegeObj 9000 to complete the quest instead. Legate Rikke may not complete her speech, making the battle unwinnable. Balgruuf may also fail to give his speech at the end of the quest. 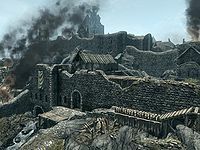 Re-entering Whiterun's main gate may update the quest objective from "Meet with Legate Rikke" to "Defend the Barricades". It is possible to attack Rikke until she becomes hostile, and then to yield to her, to move the quest forward. Balgruuf's speech may be bypassed simply by travelling away from the area after the battle. Both will prevent you from watching the entire scene, but will allow you to continue play. This bug seems to be related to guards failing to travel to the mustering point prior to the battle, and therefore the speech scene being unable to proceed until those actors are in their correct positions -- possibly related to the locking main gate that prevents your followers from joining you for the battle. 1 The Stormcloaks are attacking Whiterun. I have been ordered to defend the outer walls and keep the rebels from taking the city. 9000 Finishes quest We have successfully defended the city of Whiterun. Demonstrating the weakness of the rebels' cause and the excellence of the Imperial Legion. This page was last modified on 1 April 2018, at 19:02.